James Baker enjoyed a comfortable victory on his return to Portsmouth for the opening race of the Lakeside 5k Series. The Chichester athlete was pleased with the way he paced his effort to finish with a time of 16min 01sec. It continued his excellent record in a competition he has always run well in over the years in its many different guises. Havant’s Chris Spinks took a good second place as he ran 16.18 with Southampton’s Tom Stevens in third (16.28). Weather conditions were difficult with a very strong head wind for the more open sections of the course at Lakeside North Harbour. Baker got clear after a mile or so and picked up his pace to open a winning advantage. He said: “The 5k went well. It felt very easy in the first mile. I put in a long, hard effort just before one mile and got a good lead at halfway, then I could relax a little during final mile. I left it a bit late to go sub 16 despite a dash for the line when I saw the clock. Chichester’s Jane Harrop was fastest in her age group. The second race in the series takes place on Wednesday, May 23. 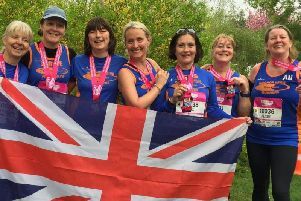 Meanwhile, Chichester’s marathon squad recorded some good times in the recent Brighton and London marathons – including four coveted sub-three-hour times. James Baker was among the top finishers in the Brighton Marathon and finished a respectable 15th out of 20,000-plus runners in 2hr 34min 36sec, showing once again remarkable consistency over the distance. Next home for the club was Tom Pritchard in a good 3.04.39. In the London Marathon, Chris Bird coped well with the conditions to lead the club home in 2.41.23, an impressive 171st out of the more than 30,000 who lined up for the start. Less than three minutes later Mike Houston crossed the finishing line in 2.44.17 in 245th place and personal best into the bargain. Also under three hours was the indomitable Mikey Neville, who clocked 2.56.13, no mean feat in itself but all the more praiseworthy coming in the middle of his challenge of completing 200 triathlons in as many days. First home in the women’s race was Lucy Thraves, whose increased training mileage over the winter paid off handsomely with a time of 3.24.52.